The Onni Group paid $17.5 million to acquire a West Loop property from Cardiff Mason Development, three months after the city approved plans for a 373-unit apartment building to rise on the site. The Chicago Plan Commission approved Cardiff Mason’s proposal in 2016 to build the 38-story tower at 352 North Union Avenue, but the plan had to be re-submitted to the commission this year due to a “surveyor’s error” the first time around, according to city records. The latest version was approved on June 21. No mortgage appears to have been issued on the property since the Sept. 17 sale, according to Cook County property records. The site barely falls inside the Near North Affordable Requirements Ordinance pilot zone established by the City Council in November, meaning any new plan would trigger a mandate for the developer to make at least 20 percent of its units affordable. The application approved in June calls for 10 affordable units — the minimum number required under the city’s 2015 Affordable Requirements Ordinance — to be included on-site. The city’s buildings department has not issued permits for the property, according to city records. The new tower would rise across the street from the 496-unit K2 apartment complex, which was completed in 2013 by Fifield Companies and is now managed by Lincoln Property Company. 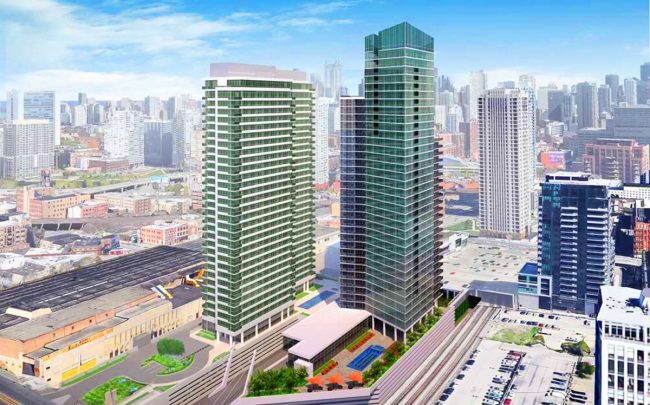 Vancouver-based Onni Group also wants to build a 356-unit residential tower at 353 West Grand Avenue in River North. Alderman Brendan Reilly (42nd) appeared to endorse the proposal in his newsletter last week, adding it’s set to go before the plan commission next month. Onni has also signaled interest in buying a 190,000-square-foot property at 901 North Halsted Street, at the southern tip of Goose Island. A spokesman for Onni did not respond to multiple requests for comment Wednesday.